The process of wine-making and its connection to the "Geula", the Redemption of the Jewish Nation, is not something that one thinks about when swilling fine wine. Yet, that's exactly the sort of association that Moshe Alon, owner of the Old Tzfat Winery, makes when explaining the process of wine-making to visitors to his small boutique winery in Tzfat's Old City. Moshe started on his journey as a vintner while he was studying at the Or Yakar yeshiva (seminary) in Tzfat. A friend invited Moshe to accompany him to wine-making course which was being taught by Dr. Arkady Papkayan, a well-known winemaker who had established the Dalton Winery. 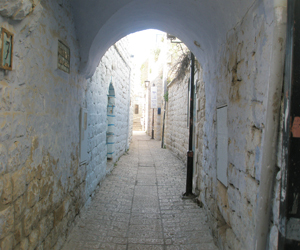 At the course's end, Moshe began to make wine in his own home in Tzfat's Old Jewish Quarter. By 1996, Moshe was starting to think about selling his wine commercially, but without equipment, the process was awkward. "I had 40 young men from the yeshiva come and help me unload the grapes from a truck, and then 12 of these young men would help me stomp the grapes - by foot!" Moshe relates. As word of his wines began to spread and the wine's popularity grew, Moshe invested, and today, his winery includes state-of-the-art equipment and apparatus which allows him to produce in excess of 20,000 bottles of various wines every year. "We make Carbernet Sauvignon, an amazing Gewurziraminer, Carbernet Frank and both a dry and sweet Merlot" Moshe says. "Most sweet wines are made from leftover grapes, but ours is a top-level wine made from choice grapes which is first-class". Presently, Moshe gets his grapes from farms, but he is cultivating a new vineyard north of Tzfat. "According to Jewish law" Moshe explains, "you may not harvest fruit from a tree for the first 3 years. It's called the law of 'Orlah'. Now, even non-Jewish vintners have discovered that grapes from young vines are not good for wine, but Jews who follow the laws of the Torah have known this for thousands of years!" Moshe's vineyard is presently in its third year, and by 2010, the first grapes will be ready for harvesting. The grapes are harvested during the weeks preceding Rosh HaShana, the Jewish New Year, and are aged in an old well under Moshe's house which is located next to his winery, anywhere from 8 - 16 months, depending on which wine is being made. Wine-making starts in fall, with students from various Tzfat schools coming in to help and learn. There are times when Moshe's attention is needed in his vineyard, but in general, he can be found in his winery in the mornings, while traveling to the vineyard to work into the evenings. He is available for tours and wine-tastings, and infuses visits to his winery with an explanation about the spirituality of wine. "Making wine" Moshe says "has many parallels to the evolution of the Jewish people as they pass through the Diaspora on their way to the Final Redemption, the Messianic Age." Moshe hopes that, in addition to simply enjoying his wines, people will, through their visits to his winery, understand the holy and mystical aspects of wine-making which is, after all, an essential element in Jewish tradition and rituals. To contact Moshe, call (050)4480-884. It is advisable to coordinate a visit beforehand. The winery is located on Yosef Caro Street near the Stairs, below the Eshtam Building which is the first building off the main parking lot.